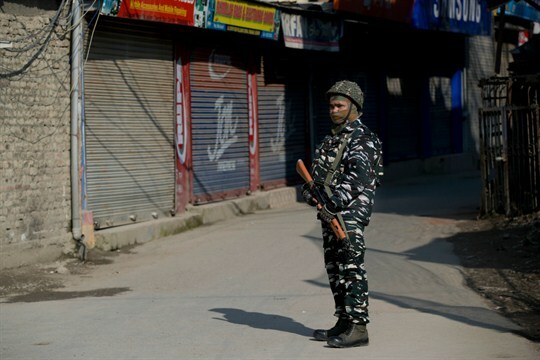 An Indian paramilitary soldier stands guard outside a closed market in Srinagar, Indian-controlled Kashmir, Feb. 28, 2019 (AP photo by Dar Yasin). In late February and early March, India and Pakistan engaged in a series of aerial skirmishes after a suicide bombing killed 40 Indian security personnel in the disputed territory of Kashmir. The crisis marked the worst escalation between the two nuclear-armed countries in nearly two decades. In an interview with WPR, Avinash Paliwal, a lecturer and deputy director of the South Asia Institute at the School of Oriental and African Studies in London, discusses the longer history of the dispute over Kashmir and what it will take to prevent future crises from escalating.